Asbestos fibers can remain in the air for days after being disturbed, resulting in invisible and potentially deadly contamination in your home or business. Getting asbestos abatement in Whittier CA will prevent the release of additional airborne asbestos fibers and help improve health & safety conditions on your property. If the presence of asbestos is confirmed, the next step is to assess the integrity of the material. While intact materials typically do not pose high risk of contamination, damaged materials do pose health risks and should be removed as soon as possible. 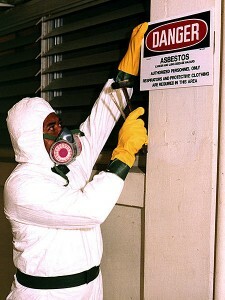 You can choose encapsulation, enclosure, or removal as your method of asbestos abatement in Whittier CA. Encapsulation involves covering the asbestos-containing material with some kind of sealant. The enclosure method requires an airtight enclosure to be built around the asbestos-containing material. Enclosure and encapsulation are temporary abatement measures. They will have to be monitored in order to ensure that no asbestos fibers are escaping. Asbestos removal, on the other hand, eliminates the hazard completely and permanently. Professional asbestos removal services for residential and commercial properties are available from AQHI Inc. We maintain rigorous safety standards while on the job and all of our workers are fully trained. Please give us a call to learn more about our services.